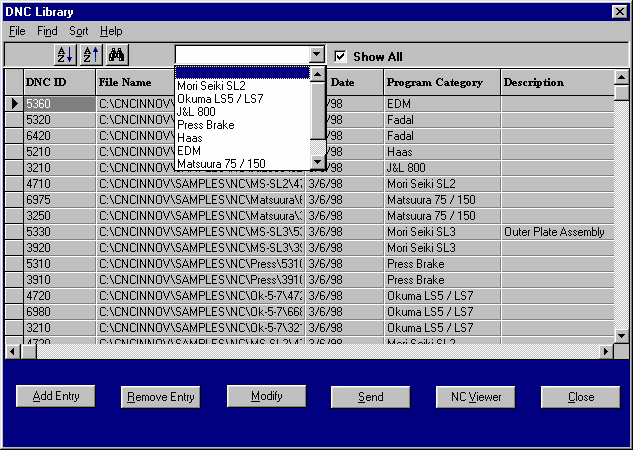 Focal*Point™ is fully automated DNC and NC program management tool. Using multiple licensing options and operation modes, Focal*Point is scalable from one machine to an entire shop floor. Administrative and programmer functions can be performed at any number of network linked PC workstations. INTERRUPT DRIVEN I/O Unlike most DNC applications that use polled I/O, Focal*Point’s serial (RS232) communications engine utilizes automatic, interrupt driven I/O providing responsive, fault-free program transfers even under the most grueling circumstances. Comparatively, applications using manual polled I/O require constant scanning of each I/O port or risk losing data. Furthermore, Focal*Point automatically detects and connects to all modern RS-232 devices including single-port and wireless equipment that is subject to machine power on/off cycles. MULTIPLE CONFIGURATION OPTIONS In most cases Focal*Point is configured as a full featured DNC host connecting an entire shop with simultaneous bi-directional communications. It is designed as a modular system that grows as your facility grows. 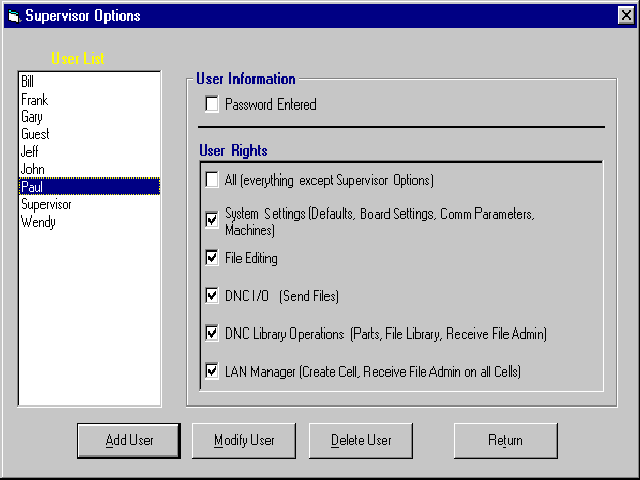 NC program management can be performed from any number of LAN connected workstations. For shops using laptops or roaming PCs, Focal*Point offers a single-port, multiple machine configuration allowing users to pre-configure each machine’s communications and NC program files. 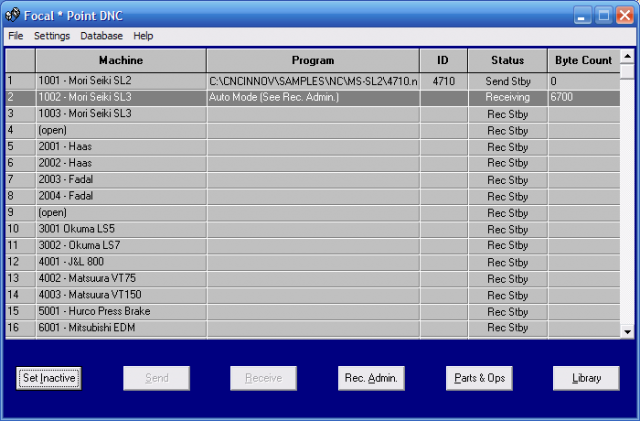 Program transfers are as easy as selecting a machine and clicking the Send command. 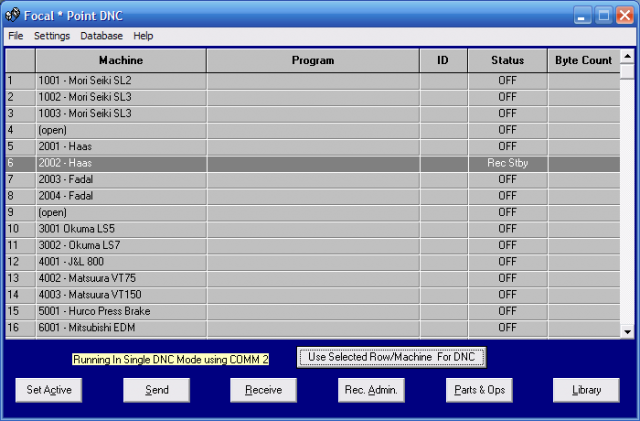 Lastly, Focal*Point includes an Administrative Only configuration for use by shop supervisors and programmers. This configuration provides full NC program management using your existing local area network. WIRED AND WIRELESS DNC OPTIONS Wireless DNC offers machine mobility, as well as, lightening and noise protection, while traditional hardwired systems offer low-cost and the highest level of data security. Choose whichever architecture meets your needs, you can even mix two architectures within one installation. Focal*Point’s full array of functions work exactly the same regardless of the distribution architecture selected. MULTI-USER NETWORKED DNC Focal*Point allows multiple users to share data and manage operations across a local area network. This is an ideal arrangement for supervisors and NC programmers. Both may enjoy remote management for released programs and uploaded files contained in Focal*Point’s Receive File Administrator. By sharing a common core, all users are assured of working with only the latest program versions. COMPREHENSIVE DNC COMMUNICATIONS Focal*Point communicates efficiently with almost all serial machine controls, including many machines with special data formats. Communication parameters such as Baud Rate, End-of-Block, Data Type, Parity, Handshaking, Data Bits, and Stop Bits are all configured with point-and-click efficiency. Focal*Point also supports optional parameters such as Character Compression, Start/End Leader Codes, Remote File Request Qualifiers, Start/End Character Strings, as well as more advanced options to satisfy a variety of machine controls. You will also find features like the Continuous Send option for repetitive drip-feed operations, alarms for faulty program uploads, File Not Found messaging, including Focal*Point’s exclusive remote printing of associated program documents and drawings—each, a real timesaver. 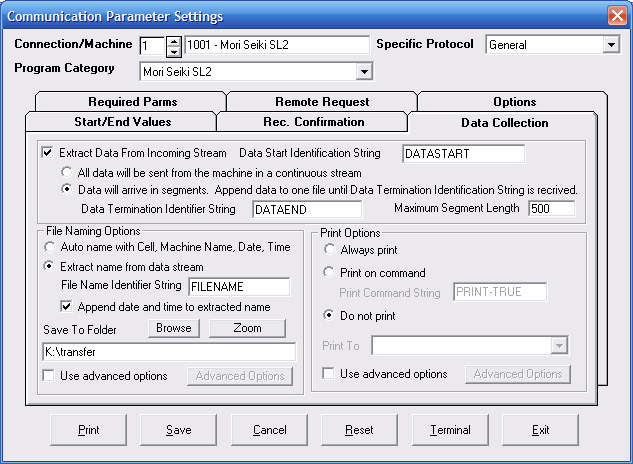 SIMPLIFIED REMOTE FILE REQUESTS Machine operators can download programs without leaving the operators panel. These operator initiated “Remote Requests” are simplified with the help of Focal*Point’s automated DNC*ID. 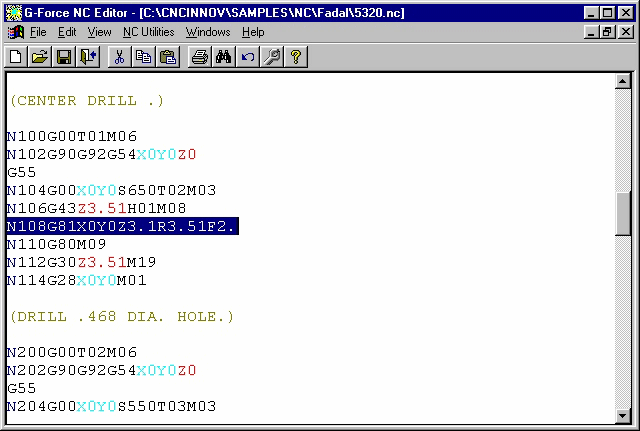 The “ID,” which is often the same as the file name, references a specific drive, path and NC program for the intended machine or machine type. Machine operators receive only the latest file revision for programs targeted to their machine control. POWERFUL DATABASE UTILITIES Focal*Point maintains two built-in DNC database tables. 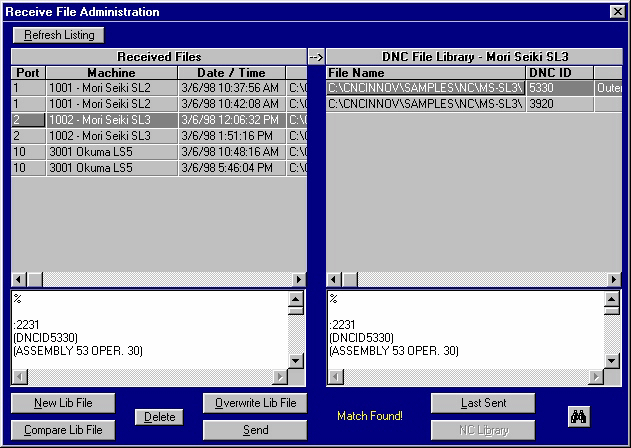 First is the DNC*Library, which simply records the location of your NC programs according to machine or machine types and generates the previously discussed DNC*ID. Each entry may also reference an identifying description and file revision level. 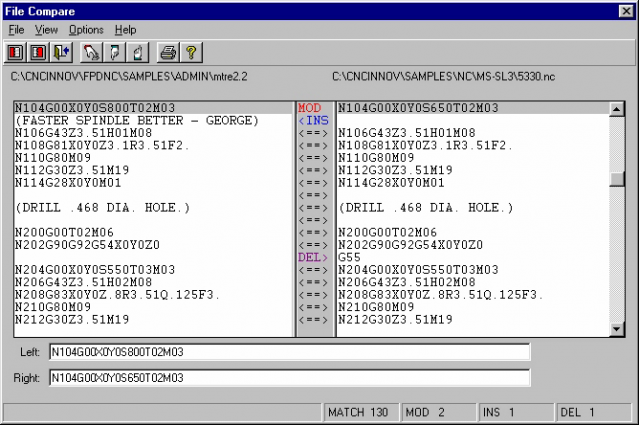 Second is the Parts and Operations database, which is the electronic equivalent of a job folder. It categorizes and links all job documents ranging from CAD drawings and history to digitized photos and setup sheets, all of which are immediately viewable using free or inexpensive multi-format file viewers. ADVANCED RECEIVE FILE MANAGEMENT TOOLS Focal*Point’s Receive File Administrator (RFA) gives convenient automated control over programs received from the shop floor. Incoming programs, requiring managed processing, are held in a fixed and secure location. When processed, each file is automatically matched with the original version and a side-by-side file comparison may be initiated. When modified programs are assigned to overwrite current versions, a new revision number is automatically generated in the DNC*Library. FILE ARCHIVE FUNCTION For ISO and regulatory compliance, the RFA can be configured to automatically archive files overwritten by new revisions. Files are stored in a way that allows for easy retrieval and review and are recorded in Focal*Point’s archive history. MULTI-LEVEL SECURITY Focal*Point’s built-in security helps to control access to all parts of the program, including vital setup parameters. Supervisors can limit access for each user or group of users. FULL EDITOR AND FILE COMPARE UTILITIES Focal*Point comes with two distinct editors and an option to designate a third program. The supplied editors can create, edit, delete and compare programs. The editors support programs of unlimited size, and provide the usual cut, copy, paste, search, and replace functions. The editors also let users designate colored display options for axis or function commands, including a very popular “tabulated” view format.